Waning state support presents challenges for today’s students, but there’s a way older generations of Hawkeyes can help. Old Gold has moved across campus into some new digs. After nine years with The Spectator and, later, IowaNow, Old Gold is settling into his new publication home with the UI Center for Advancement, where he will continue to churn out 10 columns a year on university history and traditions. There are still a lot of boxes to unpack, but it’s starting to feel like home. Um, where did I put that black and gold “I” sweater? Now, on with our business. Old Gold wants to have a few words with you fellow boomers who attended college 40 or 50 or more years ago. The rest of you are welcome to read along as well, of course. Ultimately, this affects all of us. We’ll start with some numbers to ponder. When Old Gold entered college as a freshman in 1974, resident tuition at the University of Iowa for a 16-credit course load was $310 per semester. Adjusted for inflation, this is $1,259 in today’s currency. But the price tag for one semester is now, in fact, $4,595, an amount that outstrips inflation by nearly a factor of four. Back in 1974, tuition accounted for 20 percent of the university’s General Education Fund income, while state appropriations provided nearly half, or 49 percent. The rest came from gifts, grants, income from endowments, and other sources. Today, the numbers have flipped: Tuition accounts for a whopping 65 percent of the fund’s revenue; state appropriations about 29 percent. During his freshman year 44 years ago, Old Gold’s part-time job paid $2.10 per hour. At 15 hours a week, he was able to earn enough to cover much of his tuition bill, even after payroll taxes. Perhaps this was your experience, too. Old Gold The Archivist still has the checkbook registers to confirm this. Today, however, such an arrangement isn’t possible without considerable help from other sources, including grants, loans, scholarships, and—if one is lucky—family. The answer is complex and perhaps not fully knowable. This column certainly isn’t equipped to address the question fully. Recent articles in the Des Moines Register, the Chronicle of Higher Education, and other sources point to a variety of causes of how the promise of higher education has financially excluded a growing number of Americans. We do know the numbers outlined above are a symptom of a larger problem: Public higher education has become a gated community, accessible only to those who can afford it. Certainly there are ways to patch together a financial plan to make college possible, but the difficult truth is, we boomers benefited from a time when state support made tuition affordable to most families. Today’s generation of students doesn’t benefit from this commitment of public support nearly as much as ours did. How does this state of affairs affect us all? A cornerstone of public higher education is accessibility. Those who qualify should not be denied admission solely on the basis of income or wealth. 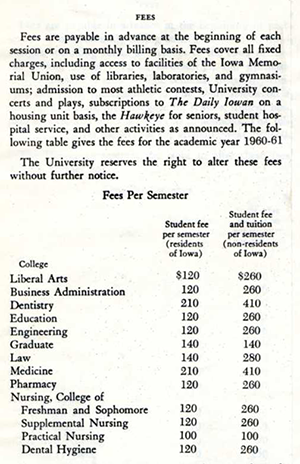 In fact, when the State University of Iowa first opened its doors for classes in 1855, tuition was free. Gradually, over time, fees were implemented by state and university officials, but were increased at a rate generally keeping pace with inflation. That changed in the 1980s, when the appropriation/tuition funding ratio began to reverse itself (see chart). 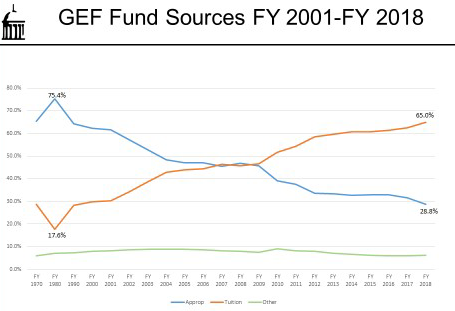 The tipping point began in 2007, when tuition for the first time outpaced state appropriations as a percentage of General Education Fund revenue. The gap has only widened since. So how do we Hawkeyes of a certain age help those who are weighted down by the cost of college? One way is to strengthen scholarship opportunities for our up-and-coming Hawkeyes. Old Gold and his spouse, for example, have committed to funding a scholarship for five years, with hopes of creating an endowment to provide long-term funding. With his family’s approval, we are doing this in the name of a former UI student who advocated for civil rights and peace during the 1960s. The Stephen Lynn Smith Memorial Scholarship for Social Justice is our way of remembering this remarkable individual. Let’s do it, Hawkeyes. Information on giving to a scholarship fund, or on creating a new one, is at http://donate.givetoiowa.org. It seems fitting that Old Gold’s first column through the Center for Advancement addresses the subject of giving. It is something Old Gold has pondered for a few years, and he hopes you consider it, too. Thank you.